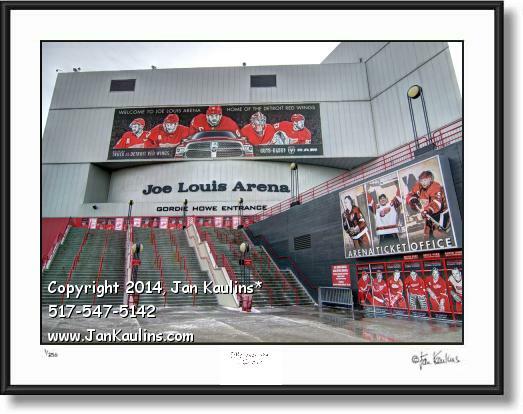 JOE LOUIS ARENA photo picture print for sale. JOE LOUIS ARENA DETROIT photograph picture photography prints for sale. This is a 'multiple exposure' portrait of THE JOE LOUIS ARENA, home of The Detroit Red Wings in downtown Detroit. In the foreground are the rows of tall steps leading up to the Gordie Howe Entrance. To the right side of this JOE LOUIS ARENA photo print for sale are the iconic images of some of the greatest Detroit Red Wings stars at the entrance to The Ticket Office.